Just nine points separates the two leading contenders for the Dunlop MSA Formula Ford Championship title at mid-season. It’s been an extraordinarily close battle between Harrison Scott and Jayde Kruger, and one which shows no sign of losing its intensity. The championship lead has passed between Falcon Motorsport driver Scott and JTR man Kruger a remarkable seven times during the first 15 races, with 18-year-old Harrison currently on top. Kruger has won six races – two each at Brands Hatch, Thruxton and Oulton Park – to Scott’s three, claimed at Donington, Oulton and Croft. 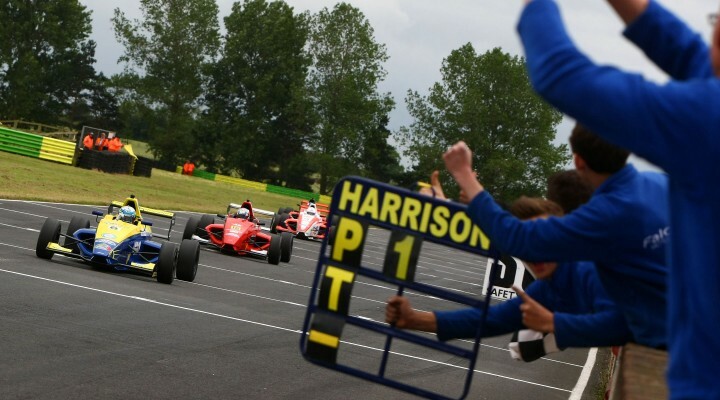 But Harrison has been the more consistent podium finisher, claiming five seconds to Jayde’s two and four third-place finishes where Kruger has none. Scott, while consistently towards the sharp end of the field all year, hasn’t shown the pace to dominate at any one track while Kruger, who has shown very strong pace at several circuits, slipped back dramatically at Thruxton and Croft, failing to make the podium at either. And that’s not to say that it will remain a two-cornered fight for the crown – the two Radical Motorsport team-mates, Juan Rosso and James Abbott, are not far behind on points and could quickly catch up if Kruger and Scott suffer a non-finish. Abbott scored his maiden Formula Ford race win from the pole of the reverse-grid race at Brands Hatch, and romped to victory last time out despite heavy pressure in the Croft finale. Rosso won at Thruxton and has finished in the top three a further six times and, given the right circumstances, will be a leading contender for the top step of the podium. There have been two other race winners so far – Sam Brabham and Ashley Sutton. Brabham, after threatening for many races to do so, finally broke through at Thruxton, winning twice for JTR to establish himself as a title contender. After skipping the Donington Park rounds, Sutton burst back in style at Thruxton with a new team and was immediately competitive, scoring a brace of overall podium finishes and a hat-trick of Scholarship Class wins.